The Mission of Challenger Little League is to provide the opportunity for children from ages 6 to 21 years old with disabilities within the Omaha and surrounding areas to play baseball as a team-player, create new friendships, gain independence, and improve self-esteem. Any child, ages 5 through 21, with any developmental and/or physical disability is eligible to play. (A child must be 6 by July 31 to play.) All players play every game with a “Buddy” system used to assist players if needed. We encourage family members to serve as buddies. All players are covered by Little League accident insurance. Baseball shirts, hats and equipment are provided. Trophies/awards are presented at the end of the season. 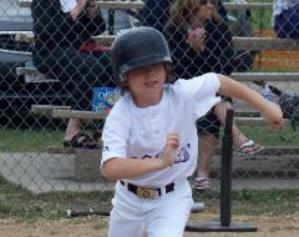 Players provide their own glove, long white baseball pants, and any specialized equipment. Parents can also purchase individual and team pictures. No transportation is provided. You can email all questions to kellycoleman08@gmail.com or call our answering service at 402-558-0031. The email is checked much more frequently. Feel free to make additional copies of the forms, or download from the website. Coaches will usually contact players after April 15th. Our season generally runs from early May through the end of June. Most games are played at the Keystone Little League Fields on 120th just North of West Maple Road. All games at Keystone will be on Wednesdays and Sundays. Volunteers are needed to "Buddy" with Challenger players. Buddies must be 10 years of age and can certainly be adults. Buddies play a key role in Challenger games. 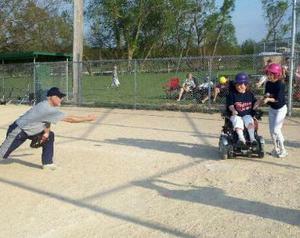 They provide encouragement and help each player safely and actively participate in the games. Buddies can sign up on the normal registration sheet. Coaches are required to fill out the form for the annual required background check. 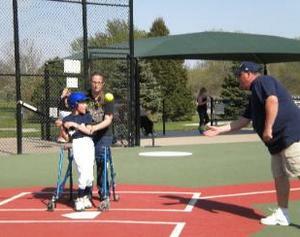 Challenger Baseball is a non-profit organization coordinated by an all volunteer board! We need the help of every family in order to make this season a success. What can you do? First of all, send in your registration promptly to be received by February 28th, so uniforms can be ordered and teams assigned. Second, pass on the information to someone else. You are our best advertisement. Third, we need every family to volunteer for at least one area as listed on the registration form. We especially need volunteers to help with field cleanup after each game. website as part of our thank you for their efforts and commitment.